Porter and I pedaled to Prospect Heights on Saturday, came upon the beautiful six-week old gourmet food shop Brooklyn Larder and stocked up on assorted rations - completely unnecessary rations, but absurdly well-packaged ones, nonetheless. 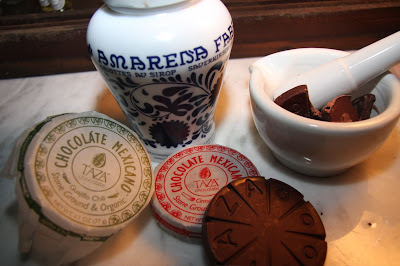 The grainy texture of the all-organic and highly addictive Taza stoneground chocolate compliments the cinnamon and guajillo chili flavors perfectly and the Amarena Fabbri wild cherries would be perfect on top of ice cream or deep at the bottom of a Manhattan. All would look great on a well-curated kitchen shelf. If given permission to do so, I will happily post Porter's Mad Men submission photo on my blog and shill for her. what a great find, I hope to find a place like that here in my neighborhood.... still finding wonderful places. Ami - that would be amazing! A friend from Chicago pointed me to your blog - Glad she did. Entertaining Blog - Well done. I have been meaning to check this place out...with cherries in a jar as beautiful as that, clearly I must waste no more time! Haha! Victory! I have posted the picture of Porter in my sidebar, along with instructions! Being old is not so bad. Hi! I think we both went to W&L? If so, saw the post on Cup of Jo and wanted to uphold the speaking tradition... a few years later. i really had to just say hello..
Looks and sounds brilliantly divine! Happy eating! Great! that would be amazing!